December 13, 2013 - Boeing announced that it will begin construction in the second half of 2014 on a new paint facility on its main campus in North Charleston, S.C. 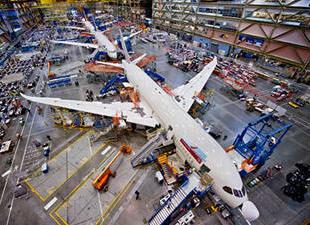 The company expects to begin painting fully assembled 787 Dreamliners in South Carolina in mid-2016. The approximately 230,000 square-foot (21,368 m2) facility will be used to apply customer liveries to Boeing South Carolina (BSC)-built 787s. Today all BSC-built 787s are flown to Fort Worth, Texas, for final paint and then flown back to South Carolina for customer delivery. "Painting our airplanes in South Carolina supports our Lean manufacturing and production optimization initiatives," said Jack Jones, vice president and general manager, Boeing South Carolina. "We can make our delivery process even more efficient by painting airplanes here in South Carolina, creating more value and convenience for our customers." The company also announced today that it acquired access to a total of 468 acres (189 hectares) in North Charleston, S.C., to protect for potential future growth in South Carolina through a long-term lease with Palmetto Railways, a division of the S.C. Department of Commerce. In addition to the 267 acres (108 hectares) sold by the Charleston County Aviation Authority, another 201 acres (81 hectares) of land in North Charleston were purchased with state bond funds allocated to Boeing. Owned by Palmetto Railways, the land will be leased to Boeing under a long- term lease. The company has an option to purchase all of the 468 acres (189 hectares) at the end of the initial lease term at the end of 2027. "This expansion makes future growth in North Charleston possible. While we expect to begin the permitting process immediately for this property, we have no specific plans for the land other than where we will locate the new paint facility," said Jones. As part of the site expansion, beginning in January 2014, Boeing will construct a new 10,000 square-foot (929.03 m2) fully equipped fire station at its main campus, which is expected to be operational by late 2014. The company will add a second autoclave in 2016 to support aftbody composite fabrication for previously announced 787 program rate increases. "We've been busy here in South Carolina this year," said Jones. "Our BSC teammates have not only been ramping to rate in component and airplane production, but they're doing it in the middle of construction zones. Our commitment to South Carolina is visibly demonstrated every day as our growth and expansion continues. I don't expect that ending anytime soon." Since late 2012, Boeing has been expanding its main South Carolina site to create more efficiencies and capabilities in production to meet committed 787 build rates. Under previously announced expansion plans, the company is adding 391,000 square feet (36,325 m2) to its aftbody fabrication and assembly building; 42,000 square feet (3,901.9 m2) to its aft and midbody component paint facility; 67,000 square feet (6,224.5 m2) in office and meeting space to its final assembly building; and a new 94,000 square-foot (8,732.9 m2) Dreamlifter Operations Center, to be completed in the first quarter of 2014. The midbody component assembly facility is undergoing construction to add additional capacity and efficiency on the production floor. In 2013, Boeing announced plans to establish IT Centers of Excellence and an Engineering Design Center, along with plans to build a new Propulsion facility in South Carolina. In November, Boeing broke ground on the new 220,000 square-foot (2,0439 m2) facility located in Palmetto Commerce Park in North Charleston (Ladson area) that will house its new 737-MAX propulsion assembly work, scheduled to begin in mid-2015.